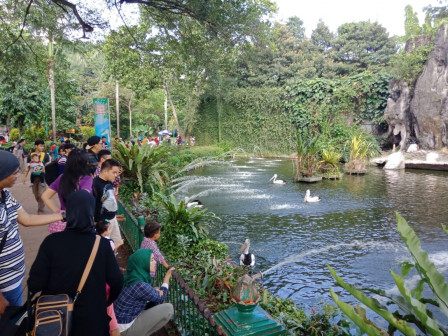 For you Indonesians who want to contribute to pouring ideas and concepts in a design contest for the future Ragunan Zoo (TMR) area initiated by Jakarta Provincial Government can register now.
" This contest will be the foundation for revitalizing the TMR area"
Why not, you can show your skills to win a total prize of Rp 1 billion. TMR Management Unit Head, Widodo disclosed that it is open for individual and planning service providers, which falls on March 18 - April 5, 2019. "This contest will be the foundation for revitalizing the TMR area," he expressed, Tuesday (3/19). In future, the TMR must be able to become a modern and innovative conservation and recreation area. Thus it could be a center for animal development in Indonesia and a domestic and international tourist destination. It is hoped that able to answer the needs and demands of the requested design, namely development of strategies and design themes for TMR area, linkages, sustainability, tropical climate adaptation, universal design, safety and comfort, estimated development costs, ease of implementation, connectivity and integration transportation. "Its design must consider the history, philosophy, existing conditions, and the development which has been done and the realization of the TMR which is parallel to the zoo in big cities in developed countries," he uttered. Aside that, criteria which should be evaluated in its design includes TMR area, concept of wildlife conservation and education; zoning design, landscape, and facilities; concept of biosafety and biosecurity management; study of connectivity and integration of transportation services to and in the area; concept of utilizing and linking assets belonging to provincial governments around the area; business planning and development. "It must refer to animal welfare, which is very important," he stated. The champion one will achieve a cash prize by Rp 500 million, second place Rp 300 million, and third place Rp 200 million. So what are you waiting for, let's register yourself at https://ragunanzoo.jakarta.go.id. 7. Presentation evaluation, determination, and winner announcement, on September 9.